I found these water drawings in the back of one of my old sketch books a few months ago. I had forgotten about them but as I flicked through and re-read the commentary I was interested to notice that they were reconstructed from memory. They are more schematic than if they had been drawn from life. I present them in this Blarney because they seem to demonstrate a method of working which was more often practised in the past than now, which was to look very carefully at something for a long time and then absent yourself from that event and attempt to reconfigure the process you were watching. The place where they were sourced from was the old Weir and sluice gates at the Millpond in Cambridge where I grew up. I suspect the Cambridge City Council may have cleaned up the old wood and brick framework in the name of tidiness since then, but I hope not. I will quote from the comments I made with the drawings at the time. "20th April, 1979. Exercise. To go out several mornings in succession and observe the same flows and attempt to reconstruct them from memory. Day cool and damp after rain." "Where one powerful fall is enclosed in a trench the water boils along the hollow created between the water falling into the trench and the same water rising up the wall opposite, reversing its flow and falling down again. Where the two downward flows meet, a continuous rearing margin of water and bubbles rises above and is forced irregularly along the channel in between their opposing flows." "These are the surface gatherings of the fast currents but a continuous flat sheet of water flows more slowly underneath them, striated by irregularities on the floor of the Millrace." "As the water gathers from a slow current in the pool to a rapid one in falling over the oak planks that form the weir it creates a vacuum underneath the water into which air is drawn back by suction along the tops of the planks. "If a jet of water is created by angling a plank into the surface of the fall, a thin flat sheet of water is deflected outward from the race and bowed into a curve by the air pressure underneath it. The edges of the sheet gather into a thicker margin of droplets and fruity swellings which travel backward slowly, relative to the rapid forward movement of the centre of the sheet. "Or if the same plank is drawn rapidly through the still surface of the river, a similar thin transparent sheet or part globe of water is raised from the surface, whose outer margins thicken into tendrils which extend and are nipped off into an even shower of droplets just before they rejoin the surface of the river." "As a plank is lowered into the depth of untroubled water beginning its path over the weir the water divides and rejoins behind the interruption of the plank and an almost flat floor of water, cobbled by the irregularities in the sawn end of the plank is visible between the combed back walls of the interrupted flows." "As the plank is pushed further down into the faster layers that skim the surface of the weir air is drawn in under the flow to the edge of the plank and the striations lengthen into ribs joined by thin webs like a Swan's foot." "Where the main flow meets a lesser but faster one at an angle the main flow runs under the lesser one which is forced into a curving diagonal by the main current, foam rising and bubbling in the corner where the tops of the two flows meet and are forced against the brickwork into eddies and little whorls. Where the combined flows run flat down the sloping brick and meet the river below, little heads dance up and fold over one another like Bats fighting." "Folding and Rippling. The iron sockets of the weir gate made hollows in the brickwork into which the water was deflected in circular eddies. As the eddies returned upon themselves and met the slipstream of the water in between them, very tiny and precise ripples like a Snake's scales trembled between the meeting of the opposing streams." 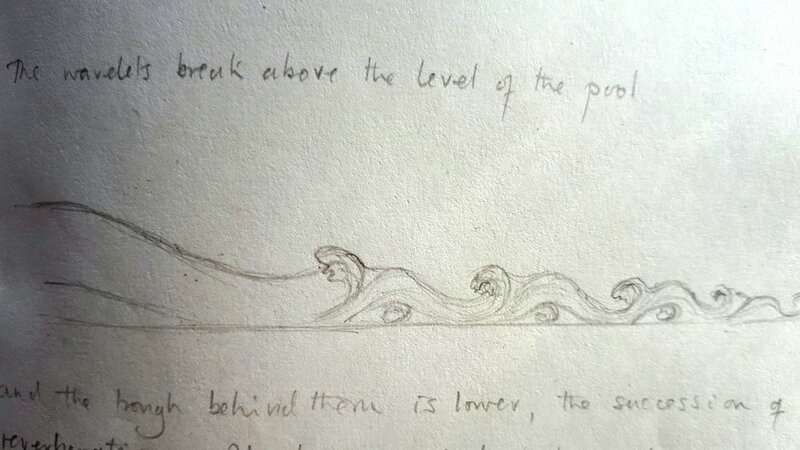 "This was a surface reverberation not affected by the mass flow of the water, or cuffs of water which rose fatly up the plank and folded back upon themselves into the river, creating the raised collars between which the little Snake scales were buffeted. "When water from a rapid mill race enters a placid shallow pool it forces a long tongue into the still water that turns up and backwards into breaking wavelets as well as sideways into eddies and slower lateral swirls." The little backward breaking wavelets peak above the level of the pool and the trough behind them is lower, the succession of reverberating swirls being carried 40 feet or more into the pond. There must be a reverse in the direction of the swirls under the peaks of the flow in order to raise the backward breaking wavelets above the level of the pool." This little Native Cherry tree caught my eye as I was traversing a hill one afternoon a couple of months ago. The Native Cherry is always a fresh light or dark green in or out of drought. Perhaps because its roots fix atmospheric nitrogen it always seems to remain healthy especially when seen against the scrubby sparseness of Native Box and the soft greys of the Eucalypts. This particular tree seemed to burn with a yellowish green fire all of its own and I began the underpainting with a pair of contrasting colours; citrus yellow green for the tree and a cool pink foundation for the taller Eucalypts that surrounded it. Pink is a good underpainting for grey, and a grey violet would help to differentiate the forest background from the high yellow green note of the Cherry tree. The base layers in any medium are important because they give a glow and a warmth to the colours laid over them. The colours I choose in the first hours also act as a memory trace for that first colour sensation, and I often note my first colour choices down on a piece of bark which I carry in my rucksack as a reminder for the duration of the painting. In this case I also decided to keep a photographic record, something I have started to do since I got hold of a Smartphone as it rather smugly calls itself. But it does have a good camera. I found the sequence interesting to look at after I had finished the painting and I present the stages here in order to demonstrate some of the processes this particular painting went through from start to finish, and in the hope other artists may be interested to look at them. I work over many sessions, fixing each layer of pastel with a thin spray of water and yolk of egg as I go, so after a few coats it can be difficult to recall that first colour sensation, the 'Colour Tune'. This matters, because the immediate colour sensations you have in front of a subject are the truest. On the day I begin a painting I look first for a simple colour plan by selecting a pair of harmonious contrasting colours on which I can build variations, in order to make from it a painting which will project sensations of space and depth to the eye from a distance, in any light, including and especially twilight. If I can still see everything in the painting with almost no light I am happy with it. Or if I find faults it is easier in this light to identify exactly where they are and to correct them. I think of this development, from the simple to the much more complex as the symphonic character of painting; just as turning a simple melody into a symphony can be an ambition for a musician turning a simple 'Colour Tune' into a complex and interesting spatial structure can be an worthwhile ambition for a painter. In the process of repeated workings the colours can go dull on me and pulling them back from a sludge of greys or worst still, discordancies is a task shared by most of the painters I know, as we drink endless flasks of tea in the forest or the studio and work on an uncooperative painting. This is the necessary drudgery of art. I find that starting directly into colour allows a more dynamic and rhythmical process of composition than tying down all the boundaries with line too early. That can come later when I start to look for a stronger tonal structure. In some ways the whole painting is a colour beginning because it is not completed until the tonal structures and contrasts are fully established and that doesn't usually happen until the final sitting. I call this Cherry Tree 'Mystical' because in Tasmania every patch of untouched bush seems to consist of infinitely varied forms lit by the impulse of some mysterious, visionary imagination. This little Cherry Tree seemed to feel a part of that so tactfully that I felt I could do no less than to celebrate its simple magic. When you are working on one painting, sometimes that painting suggests the possibility of another one or even several more. With 'The River in Flood', I began to think of a series of panels as I was working on the first one. It seemed a shame to let this river flow away into infinity without capturing more of it, and so I began a second panel almost as soon as I had completed the first, standing on the same spot but looking further downstream. When I had finished both panels I lined them up on the studio wall stepwise, as shown below, in order to reinforce the actuality of the water levels falling continuously downstream. I soon realised the explanation they gave of the rapids was incomplete. It was quite hard to work out how the water got from one to the next so I decided I needed a third panel to go in between the first and second panels. In effect a triptych. It was winter by the time I got back to the river, the light was much harsher and the willows had lost their leaves which explains the violence of the orange highlights in the water. Together with photos of the triptych hung in sequence I also show a 'colour beginning' which was made further down the same river but ten years earlier. I include this because I think it explains how all of the panels were started using a minimal range of colours; white, black, green, dark and light blue and violet for the water, and a warm brown base for the rocks. This 'underpainting' allows me to explore the drawing but also provides a pigment base which gives a warmth to the colours which are laid over the top of it. Laying down one colour, fixing it, and applying a different but related colour over the base coat gives a glow to the pigment which cannot be achieved with a flat coat of pastel (or paint) however thick. This is especially true for pastel. I apply the pigment in layers but without blending, working from a base of gesso, silica, and yoke of egg and fix with a fine aerosol spray or mist of water. As the pigment dries, it is fixed from behind by the yolk of egg in the board and the egg gives the pigments a luminosity otherwise only associated with tempera. The lights remain light, but the dark colours become richer and darker. This recipe has been used for centuries beginning with frescos, and a similar fix, (skim milk) was used by Degas, which is how he achieved those luminous colours. I include photos of the triptych taken in close up from the side to show how successive fixed layers of pigment can give a three dimensional quality to the surface of the painting. This procedure which is only possible using a yolk of egg fixative for several successive layers of pigment also increases sensations of space, depth and surface movement within the painting. This painting, which eventually became a group of three paintings, began in the Spring of 2012 when I put my head over the bridge at Corralin Gorge and the roar of the flood waters below soon became irresistible. Later that day I prepared some large gesso panels on plywood, and next morning early I scrambled down the goat track to the North Esk River and went to look for where the noise was loudest. It was easy to find, at the end of a wide and placid pool where the river is forced between boulders into a long and smooth tongue of water which moves so fast that its surface remains smooth and transparent like a curved reflecting lens through which the greenish black rocks are still visible. As this waterfall gulps down air a multitude of little bubbles are created which fight and jostle with each other underwater until they can break upwards through the surface of the stream into masses of silvery blue foam. It is a joyous process to watch once you have found yourself a secure foothold to watch it from, and you have the advantage, now you are there, of being able to study the same processes over and over again all the way down the river until you begin to see patterns within the chaos. This is not something a camera could do for you, because vital tool as a camera is, it can only record. It cannot perceive or interpret patterns that repeat over time; nor can it close its eyes at night and remember what it saw and heard during the day. Nor can it remember the smells of dry leaves and wet rock, or hear the orchestra of sounds made by water falling, or coin words for them as the native Tasmanians could and did. The sound that turbulent water makes, a continuous roar within which a rumble and a pulse can be detected is represented in the Palawa language by "moe-win-e-dur-um", which vividly suggests stones turning over underwater. For the more delicate sounds the little flows make as they meander and splash at the margins, "lea-lari-ghtea", and most powerful of all, "Mangana-Lienta" which could be Latin if the Romans had thought of it first but no; they drowned in nouns, verbs, and adjectives; and so do we, whereas the first Tasmanians sang their metaphors for nature aloud. 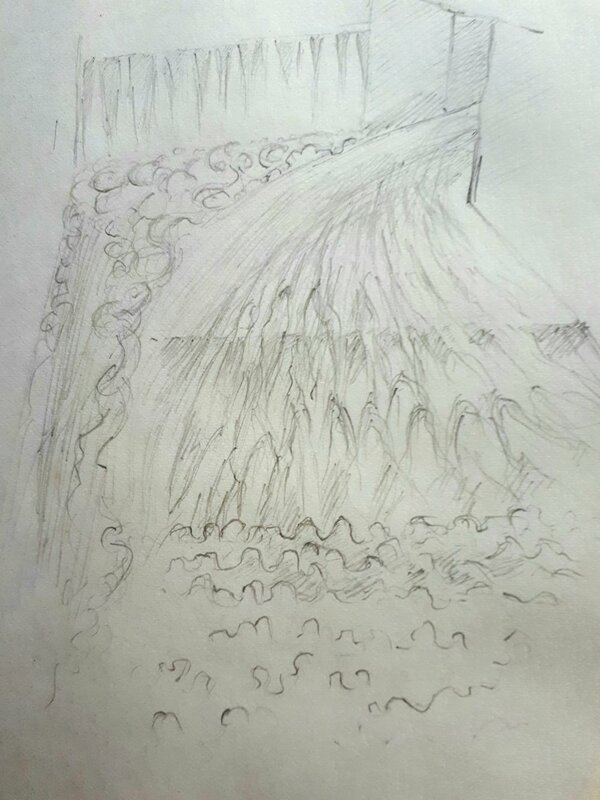 This small pencil drawing shows a parallel event to the larger pastel but in miniature, a Bonzai'd waterfall as it were. The process of water dragging down air as it falls headlong into a pool below, the flow of water contained by rocks and the frictional drag of the slower currents against the rock faces are all perhaps easier to read at this small and much tamer scale. The wind ripples which move the surface of the water backwards against the direction of the current can be seen at the bottom right of the drawing. In a major flood they would of course be invisible. For paintings where there are violent contrasts of tone from the black rocks up to the bluish white foam I begin the drawing almost in monochrome; just enough to show the patterns and follow the corrugations that water is forced into as it is slowed and lifts up its surface on its approach to a rock, or gathers into a waterfall which plunges down and buries itself in a mass of bubbles in the pool below. This pastel sketch is not so much an unfinished painting as the finished beginning of another water painting, and over the course of this Blog (what a hideous word, Blog, who created it? It sounds like something stuck in a toilet), over the course of this Blarney I shall show more of them. 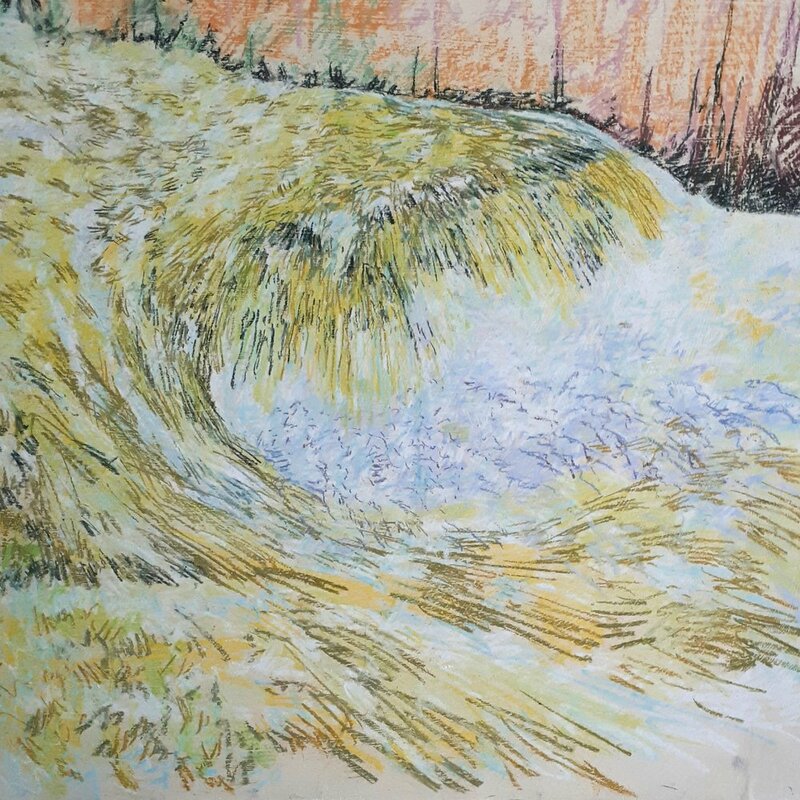 I include 'At the Bend' (painted along the same river a few years earlier) in order to indicate how I attempt to reduce the first description of a complicated event into a simple colour language which can be worked over with successive layers of pastel, fixing thoroughly between coats so as to preserve the clarity of the first idea. At the end of a mornings frantic drawing, I pack up and scramble back up the cliff towing my panel behind me one handed like a child's blanket. Then there will be a break. Perhaps it rains in the night and the rocks are too slippery to risk it. But soon another day dawns fine, and then by looking at what I have done I get an idea of what to do next and I go back. Over the weeks this first observation turns into an explanation, a rendering into line and colour of what I have experienced every day, down there, wedged between rocks at the base of cliffs which have been hacked and smoothed from dolerite by a river which has bullied and tormented, and rejoiced and sung its way along that same course for hundreds of thousands of years. A world class exhibition space in the middle of nowhere might sound odd to many ears, until you hear that the place is Cradle Mountain in Tasmania. Originally designed as a naturally lit gallery for wilderness photography, the design of the rooms is ideal for paintings or prints, and when I was offered the chance to show a selection of my work there about a year ago I readily accepted it. Soon after I began working in Tasmania, using pastel and tempera on large gesso panels, outdoors and in all seasons, I had the idea that at some stage I would like to present all of my work as a sequence, or a collection of sequences, a 'Book of hours and Seasons' encompassing the astonishing beauty and purity of the Tasmanian landscape, a landscape the like of which disappeared a thousand years ago from Europe, and from most other places in the world. This exhibition includes paintings from some of those many pastel on panel series in which I have tried to distill the essential features of a place, a weather, a time of day, a season; and it also includes the first twelve examples of a print on watercolour paper series which I have been developing with the assistance of a very expert printer in Hobart, Simon Olding. Eventually I plan to produce another 48 prints in this series, with the overall title 'Of Stone and Shadows', which will I hope allow strangers, as well as local Tasmanians, to gather intimate glimpses, as well as an overall picture, of the extraordinary landscape which has over the last 30 years become my obsession. This winter past, 2017, I decided to work small, about one third the size I am used to, and to treat the intensely dramatic Tasmanian sunset in a rocky landscape more as I would a still life painted indoors. I wanted to create sensations of solidity and roundness in the rocks and trees, and investigate the long black shadows cast by the trees and even by myself sometimes as my own shadow preceded me up the hill and into the forest. I also thought it would be interesting to keep a record of my colour beginnings because these underpaintings become lost in the process of painting. Perhaps lost is the wrong word because without these base layers of pigment the top coats would lack richness. Below I am showing the beginning and the end of a painting together in order to indicate that the first stages are drawn directly in colour, without line, in order to establish a rhythmical basis for the composition. If I used line, I might not be able to see the colour basis for the subject.